CHICAGO – Don’t you hate it when you figure out where a film is going long before it gets there? That could be a problem with “Third Person,” but writer/director Paul Haggis (“Crash”) also adds enough secrets to chew on and enough multiple pathways to explore. Enter at your own risk. The story relates three inter-connected love stories that take place in Paris, New York City and Rome. 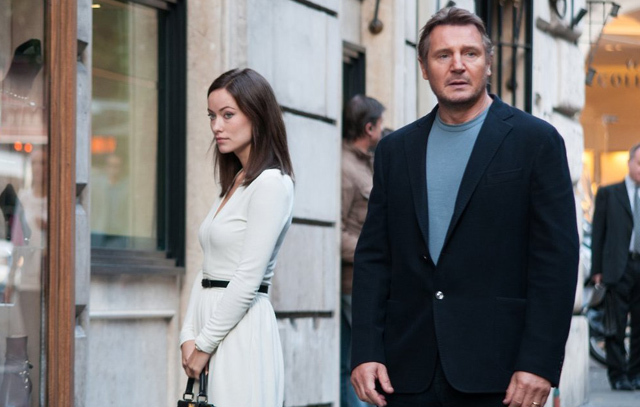 Michael (Liam Neeson) is a writer in Paris, and he is having an affair with one of his protégés, Anna (Olivia Wilde), and is separated from his wife Elaine (Kim Basinger). Concurrently, two other stories are taking place in other cities, but seem interconnected. In New York City, an ex-soap opera actress Julia (Mila Kunis) is trying to clear her name after being accused of almost killing her son, now in the custody of his father Rick (James Franco). In Rome, an American businessman named Sean (Adrien Brody) is inadvertently is smitten by a fiery Italian woman named Monica (Moran Atlas), and gets involved in something he didn’t expect. All three scenarios clash as the passion and stakes rise.